Welcome to New Age Automotive Svc Llc. New Age Automotive Svc Llc. "Russ, the owner and chief mechanic, has always resolved every.."
"Have had them to work on my truck twice now.."
"The team at New Age Automotive did a great job.."
"Russ and Dawn are genuinely friendly and knowledgeable about automobile.."
"Had a great conversation about the problem I was having.."
"excellent work, friendly and knew how to get to get.."
"Russ does excellent work. He's very efficient and precise. 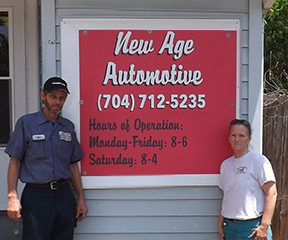 His.."
"I would highly recommend New Age Automotive Svc Llc. .."
"Good on both spectrums as well as knowledgable. I was.."
"At my best friend's recommendation, I left my car to.."
"They are honest people and truly care about the quality.."
"I found you business by accident several months back. I.."
"Russ was able to diagnose and fix problems with our.."
"I would recommend New Age to anyone looking for an.."
"The owners are genuine people who are honest and hard.."
"Top Notch. Russ and Dawn are as honest as they.."
"Excellent work, quick service times, and Russ will go out.."
"New age is # 1 in customer service as well.."
"Russ will listen to your issue then do a through.."
"Russ and Dawn are wonderful. They take their time to.."
"Very nice, honest, salt of the earth people. They went.."
"Problem is determine in a timely manner, repairs complete accurately.."
"that if you want someone working on your car that.."
"This is a really great shop and the people here.."
"That I am very satisfied with your service. You have.."
"Russ is very knowledgeable with working on automobiles and Dawn.."
"I have shared that I had a great and experience.."
"This shop does it's best to get you done in.."
"They did a wonderful job for me on a simple.."
"Russ is the best mechanic I have ever dealt with!.." "Will not be going back due to fact that feel.."
"Russ is an excellent mechanic and will fix it right.."
"I would tell them that they are very customer oriented.."
"Very honest and good service! Upfront about what needs to.."
"Best shop in town! I am very impressed with the.."
"Russ is very thorough and knowledgeable. His son Gary is.."